As we age the junction between lower eyelids and cheeks (The Lid-cheek junction) becomes hollow and deepens, causing a tired ageing appearance. This hollow area, also known as the “tear trough” often appears darker than the surrounding skin due to the reflection of light. For some unlucky individuals, the hollowing of tear troughs and the appearance of dark circles can happen at a younger age. This is usually associated with a genetic predisposition, stress, prolonged illness, cigarette smoking or insufficient sleep. Patients often dislike the tired appearance associated with this condition. 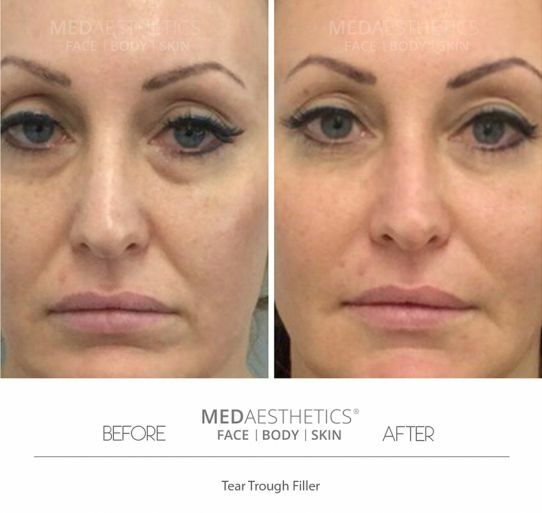 At Medaesthetics™in Perth, we specialise in advance dermal filler technique using soft cannulas. Tear trough hollowing is often accompanied by midface volume loss. Therefore, it's important to add volume to the mid-face area (upper cheeks) using dermal fillers to properly address this problem. One to two ml's of dermal fillers can be safely injected in one treatment session. We recommend injecting with soft cannulas to prevent damage to the nerves and blood vessels in the area. Dermal Fillers replenishes the lost soft tissue volume in the area, resulting in a fuller, more contoured look. The procedure takes around 15 -30 minutes. Results are seen instantly and give a younger and more fresh appearance. Effect of the treatment can last between 8 and 18 months.